The Adam Smith Institute has blogged on that fact that a statue of Adam Smith will soon go up in the historic heart of Edinburgh. The statue shows Smith in later life – he spent the last twelve years of his life in Edinburgh, where he had been appointed a Commissioner of Customs, which might explain his slightly stern look. Behind him is a ploughshare, modelled from a contemporary plough in the Scottish Farming Museum, which reminds us of an economic doctrine from which Smith made great advances – the physiocrat doctrine that all wealth stemmed ultimately from agriculture. To his front is a beehive, a symbol of industry, topped by a globe on which Smith rests his hand - made invisible by his academic gown. The most likely date of the unveiling is Friday 4 July. 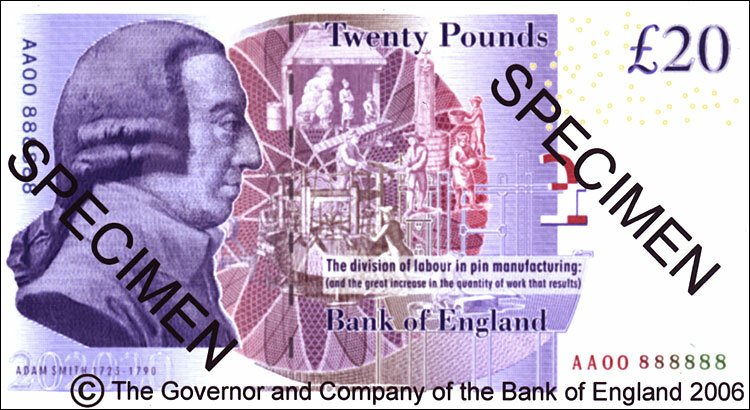 The statue follows Smith appearing on the English £20 note. He is in fact the first Scot to adorn an English banknote, and the first economist. Of the four banks that issue notes in Scotland, the Clydesdale Bank has Adam Smith on their £50 note. Update: Gavin Kennedy at the Adam's Lost Legacy Blog reports that there is News on the New Adam Smith Statue from New Zealand.